Kykuit is a 40-room Classical Revival Georgian mansion that was built for John D. Rockefeller, founder of Standard Oil, and at the time, one of the richest men in America. He purchased the land in 1896 and after construction, improvements and extensive renovations the house was finally considered complete in 1913. 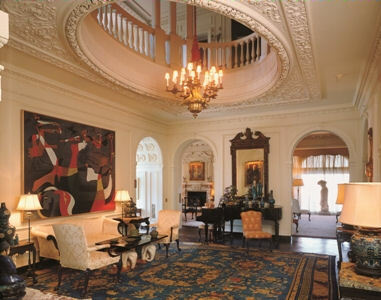 The house has been home to four generations of Rockefellers, the last being Nelson A. Rockefeller, who after his death in 1979 bequeathed his one-third interest in the estate to the National Trust for Historic Preservation. I have to admit that my knowledge of the Rockefeller family before this tour was sorely lacking. I knew they were famously rich, involved in politics and great philanthropists (all major art organizations have a Rockefeller on the board). Third generation, Nelson Rockefeller was the governor of New York and the 26th vice president of the United States. Lucky for us, he was also an avid art collector. The house and the surrounding property are beautiful but the art is really the thing to come and see. Normally, in a turn of the century classical home one would expect to see a lot of stern portrait paintings of the family and the standard John Singer Sargent paintings. These are there, make no mistake, but there are also a lot of unexpected surprises in the form of mid-20th century modern painting and sculpture. I won’t go into detail because it is more fun to be surprised by what you will find at Kykuit. What I liked best about the house was that it feels like a real home that people lived in rather than a museum that has been reconstructed. 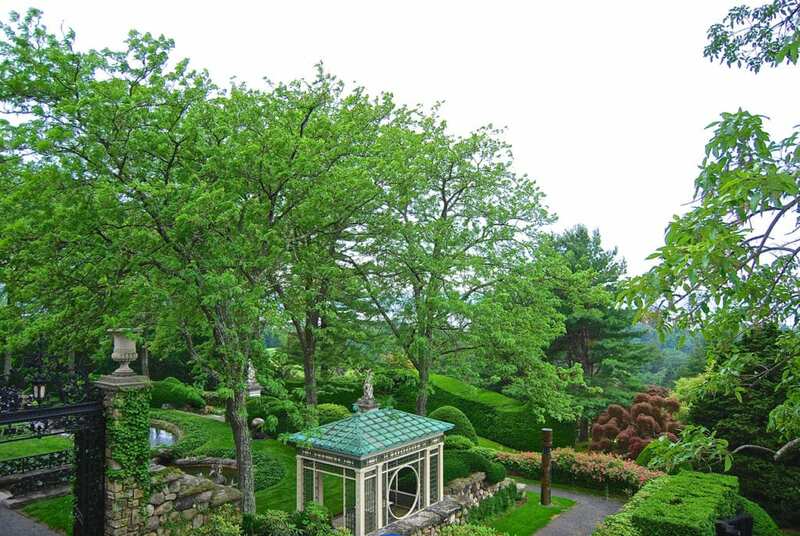 It overlooks the Hudson River at the Tappan Zee, and although an entire village lies between the estate and the river the view is uninterrupted tranquility. Kykuit is technically in Pocantico Hills, a short one hour drive from New York City. Nearby Tarrytown and Sleepy Hollow have lots of activities, shops, restaurants and historical sites to visit after the tour and there is plenty to enjoy along the Hudson River. Public tours are conducted via shuttle from the Visitor Center, located at Philipsburg Manor House on Route 9 in Sleepy Hollow, New York. You cannot enter the grounds unless you are on a tour, which are managed by Historic Hudson Valley. This organization (big surprise) was set up by John D. Rockefeller, Jr. in the 50s to celebrate the region’s history, architecture, landscape, and culture and provides tours of many historical homes in the area. According to the website, children under 5 are not permitted on the Grand Tour and under 3 for the other tours, and for good reason. The last thing you need is your toddler knocking over a Ming vase or wiping their M & M-smeared hands on a Picasso. I would not recommend younger children for the Classic Tour at all. We took our eight-year-old daughter as preparation for a trip to France we have planned for next summer. We figured if she can take a two hour tour of an old house here then she could probably manage Versailles. She passed with flying colors and had a great time. My advice is to know your child(ren) and her tolerance for waiting patiently and listening politely. There are many kid-friendly houses to tour in the Hudson Valley area as alternatives if your kids can’t hack the Rockefeller estate. Our tour was conducted by a not-your-average docent, Laura Bunt, a local author whose father was a cabinetmaker for the Rockefeller family for many years. She provided a unique perspective as she grew up on the estate and was able to share a number of personal anecdotes. As a good docent would, she encouraged participation, especially with our daughter, asking questions and talking to her rather than over her. We took the Classic Tour, which was just over 2 hours. If you are going to go to Kykuit, I strongly recommend taking the Grand Tour. It doesn’t cost that much extra and trust me, once you are in the house and looking into the oval balcony above the music room, you are going to feel like you are missing something by not going up there. Honestly, I love old houses so I would have liked to have seen every inch of the house from the servants quarters to the kitchen below. Historic Hudson Valley kindly provided me with free admission to Kykuit. Angela is the History Buff Traveling Mom. In addition to her love of travel and books, she explores the history of NYC houses and their restoration in her blog, BrownstoneCyclone.com.